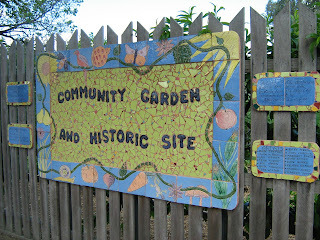 One of Adelaide's very few Community Gardens had an open day today. Eight months ago, I donated my entire pot plant collection to them. Today, I went along to see the garden, and get a look at my "babies". Sadly, I didn't see them all, several were still in storage waiting for the ground to be prepared in the places where they were to be planted. 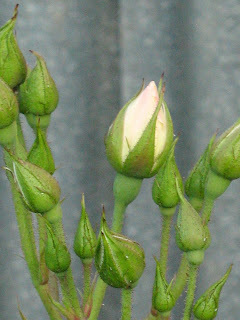 Some had been sold and were now happily living in other gardens. Here are some of the things I did see. This lovely sign at the entrance to a site that used to house a Jam Factory. Inside the gate this path leads past garden plots on both sides which are "owned" by community members and they grow whatever they want to grow. Some grow vegetables, some grow herbs, I saw strawberries in one plot. It's been an odd kind of day. I planned on sleeping late, since I didn't have to be at work until 10am. Well, that didn't happen, I woke up at 6.45. I pottered around, cooked my porridge, (ate it too), made my bed, took a look at my pots of seeds, which aren't showing the slightest sign of life apart from the beans which are starting to climb already. I must remember to plant more seeds. I knew I had some shopping to do, but I also knew that if I went to Coles and shopped, then I wouldn't want to be bothered going back by 10 to start my shift. So I dithered around for another couple of hours, did my shoulder exercises like a good girl, ouch, they still hurt, and I don't seem to be making any more progress with the shoulder movement. When I eventually got to work, having been up doing nothing much for quite some time, I was feeling a bit tired. Boredom will do that to you. You all may or may not know that I'm trying to lose a little weight here. Not a lot, I don't want to look like a scrawny plucked chicken. I just want to lose enough to take some of the pressure off my hips and knees and to lessen the discomfort of the varicose veins. So I've been eating less, no snacking between meals and smaller portions on the plate at dinner. This wasn't working out so well, so I decided to add some extra walking to the routine. I already walk to and from work, and walk all around the store doing whatever the boss wants me to do. That takes care of my mornings. Now I've added a 3km walk to the afternoons. Easy enough, for an old lady who has let herself get very unfit. I've been reading around the interwebs about people who walk or run for 6-8-10kms at a time. Now, I used to be able to walk 6kms without even thinking about it. Not so long ago either. What the heck happened in the last six months? I can barely make it out the door some days. 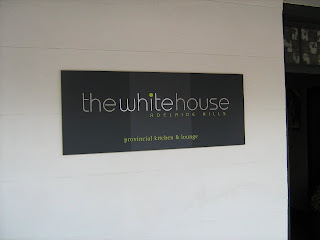 Hahndorf has a White House!! Not as big as the American one, but much easier to get into. -: has this amazing design painted on the entrance door. Inside, I asked and was given permission to photograph some shoes. I love how pretty they are. and isn't this one of the prettiest Cellars you ever saw? Udder Delights has free cheese tastings, which I didn't try since they were already quite busy, plus I knew it would take me forever to decide which cheese to try. They have so many choices. As you can see it's also a licensed cafe. The Udder Delights cafe is housed in this very lovely building. Can you see the railing in the mid left there? By the long window. Beyond that is this fairly steep old stone stairway leading down to what I assume is the cellar where the cheeses are stored. 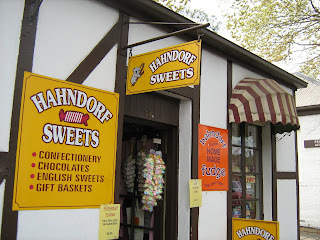 I was disappointed to find that most places in Hahndorf had signs on doors or in windows that said no photographs allowed. Check out this one; non-German foods, yes, but look, not a single misplaced apostrophe! and window displays, most of which didn't turn out because of glare or reflections from passing traffic. See my reflection in this one? This next building houses the Puppet Shop on one side and something I can't remember on the other side. These marionettes put me in mind of The Sound Of Music, the scene where the children make a puppet show of the song The Lonely Goatherd.